When our Sun erupts with giant explosions—such as bursts of radiation called solar flares—we know they can affect space throughout the solar system as well as near Earth. But monitoring their effects requires having observatories in many places with many perspectives, much the way weather sensors all over Earth can help us monitor what's happening with a terrestrial storm. By using multiple observatories, two recent studies show how solar flares exhibit pulses or oscillations in the amount of energy being sent out. Such research provides new insights on the origins of these massive solar flares as well as the space weather they produce, which is key information as humans and robotic missions venture out into the solar system, farther and farther from home. The first study spotted oscillations during a flare—unexpectedly—in measurements of the Sun's total output of extreme ultraviolet energy, a type of light invisible to human eyes. On Feb. 15, 2011, the Sun emitted an X-class solar flare, the most powerful kind of these intense bursts of radiation. Because scientists had multiple instruments observing the event, they were able to track oscillations in the flare's radiation, happening simultaneously in several different sets of observations. 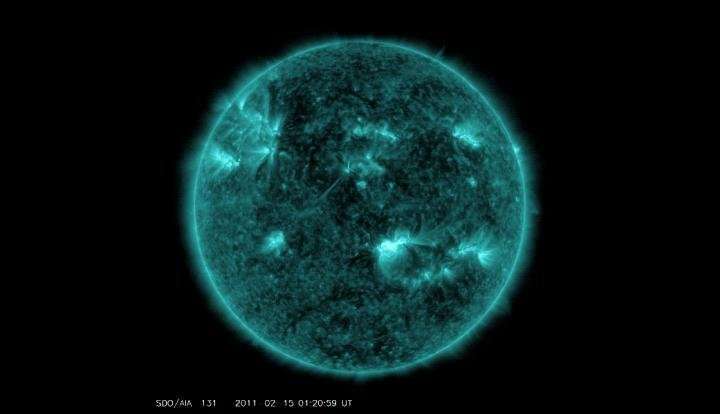 "Any type of oscillation on the Sun can tell us a lot about the environment the oscillations are taking place in, or about the physical mechanism responsible for driving changes in emission," said Ryan Milligan, lead author of this first study and solar physicist at NASA's Goddard Space Flight Center in Greenbelt, Maryland, and the University of Glasgow in Scotland. In this case, the regular pulses of extreme ultraviolet light indicated disturbances—akin to earthquakes—were rippling through the chromosphere, the base of the Sun's outer atmosphere, during the flare. What surprised Milligan about the oscillations was the fact that they were first observed in extreme ultraviolet data from NOAA's GOES—short for Geostationary Operation Environmental Satellite, which resides in near-Earth space. The mission studies the Sun from Earth's perspective, collecting X-ray and extreme ultraviolet irradiance data—the total amount of the Sun's energy that reaches Earth's atmosphere over time. This wasn't a typical data set for Milligan. While GOES helps monitor the effects of solar eruptions in Earth's space environment—known collectively as space weather—the satellite wasn't initially designed to detect fine details like these oscillations. When studying solar flares, Milligan more commonly uses high-resolution data on a specific active region in the Sun's atmosphere to study the physical processes underlying flares. This is often necessary in order to zoom in on events in a particular area—otherwise they can easily be lost against the backdrop of the Sun's constant, intense radiation. "Flares themselves are very localized, so for the oscillations to be detected above the background noise of the Sun's regular emissions and show up in the irradiance data was very striking," Milligan said. There have been previous reports of oscillations in GOES X-ray data coming from the Sun's upper atmosphere, called the corona, during solar flares. What's unique in this case is that the pulses were observed in extreme ultraviolet emission at frequencies that show they originated lower, in the chromosphere, providing more information about how a flare's energy travels throughout through the Sun's atmosphere. To be sure the oscillations were real, Milligan and his colleagues checked corresponding data from other Sun-observing instruments on board NASA's Solar Dynamics Observatory or SDO, for short: one that also collects extreme ultraviolet irradiance data and another that images the corona in different wavelengths of light. They found the exact same pulses in those data sets, confirming they were a phenomenon with its source at the Sun. Their findings are summarized in a paper published in The Astrophysical Journal Letters on Oct. 9, 2017. These oscillations interest the scientists because they may be the result of a mechanism by which flares emit energy into space—a process we don't yet fully understand. Additionally, the fact that the oscillations appeared in data sets typically used to monitor larger space patterns suggests they could play a role in driving space weather effects. In the second study, scientists investigated a connection between solar flares and activity in Earth's atmosphere. The team discovered that pulses in the electrified layer of the atmosphere—called the ionosphere—mirrored X-ray oscillations during a July 24, 2016, C-class flare. C-class flares are of mid-to-low intensity, and about 100 times weaker than X-flares. Stretching from roughly 30 to 600 miles above Earth's surface, the ionosphere is an ever-changing region of the atmosphere that reacts to changes from both Earth below and space above. It swells in response to incoming solar radiation, which ionizes atmospheric gases, and relaxes at night as the charged particles gradually recombine. In particular, the team of scientists—led by Laura Hayes, a solar physicist who splits her time between NASA Goddard and Trinity College in Dublin, Ireland, and her thesis adviser Peter Gallagher—looked at how the lowest layer of the ionosphere, called the D-region, responded to pulsations in a solar flare. "This is the region of the ionosphere that affects high-frequency communications and navigation signals," Hayes said. "Signals travel through the D-region, and changes in the electron density affect whether the signal is absorbed, or degraded." The scientists used data from very low frequency, or VLF, radio signals to probe the flare's effects on the D-region. These were standard communication signals transmitted from Maine and received in Ireland. The denser the ionosphere, the more likely these signals are to run into charged particles along their way from a signal transmitter to its receiver. By monitoring how the VLF signals propagate from one end to the other, scientists can map out changes in electron density. Pooling together the VLF data and X-ray and extreme ultraviolet observations from GOES and SDO, the team found the D-region's electron density was pulsing in concert with X-ray pulses on the Sun. They published their results in the Journal of Geophysical Research on Oct. 17, 2017. "X-rays impinge on the ionosphere and because the amount of X-ray radiation coming in is changing, the amount of ionization in the ionosphere changes too," said Jack Ireland, a co-author on both studies and Goddard solar physicist. "We've seen X-ray oscillations before, but the oscillating ionosphere response hasn't been detected in the past." Hayes and her colleagues used a model to determine just how much the electron density changed during the flare. In response to incoming radiation, they found the density increased as much as 100 times in just 20 minutes during the pulses—an exciting observation for the scientists who didn't expect oscillating signals in a flare would have such a noticeable effect in the ionosphere. With further study, the team hopes to understand how the ionosphere responds to X-ray oscillations at different timescales, and whether other solar flares induce this response. "This is an exciting result, showing Earth's atmosphere is more closely linked to solar X-ray variability than previously thought," Hayes said. "Now we plan to further explore this dynamic relationship between the Sun and Earth's atmosphere." Both of these studies took advantage of the fact that we are increasingly able to track solar activity and space weather from a number of vantage points. Understanding the space weather that affects us at Earth requires understanding a dynamic system that stretches from the Sun all the way to our upper atmosphere—a system that can only be understood by tapping into a wide range of missions scattered throughout space. This is just one more nugget which shows the Sun-Earth connection is far more complex than the rudimentary assumptions used by astrophysicists and in-turn, the AGWite Chicken Littles claiming the sky is falling. Until a true understanding of the Sun-Earth energy connection is known, any and all claims by AGWites of impending doom are meaningless blather.